What are Converged Networks for Hospitality? Put simply, a converged network is the grouping of telephone, video and data communication within a single network. Designing and managing all of these within one network offers convenience and flexibility that are simply not possible with separate infrastructures. No longer do properties need different cables for different services. For example, by delivering a Power over Ethernet (PoE) switch, hotels can deliver power and data with the same cable. This can reduce costs and enables the delivery of multiple applications efficiently without having to manage each vendor-specific installation individually. The integration of all these technologies certainly increases the complexities of the WiFi network but when done correctly – with a well thought out design and implementation, can lead to significant operational efficiencies. Imagine your property being completely connected – from the minute a guest enters the property until they drive away happy. Everything from the security guard’s security application, checking in with the front desk PMS, handheld devices used for housekeeping, and technology systems in the meeting rooms, to mobile-device key entry, room service ordered from a mobile concierge, access to the gym / pool facility, Internet access, watching TV and making a mobile purchase in the gift shop – every step of the way your guests and hotel services are connected. In order for all of this to work, properties need excellent enterprise grade Internet that can support the proliferation of devices that your guests need to get online – from laptops and tablets to wearables and smartphones. But when done properly, a single vendor can manage this entire network, quality of service, communication and optimization all together – ensuring connectivity for all technologies. What are the advantages of a Converged Network? There are a number or reasons why convergence is becoming the new standard for medium to large hotel properties, luxury resorts and other hospitality venues. In the past multiple networks were managed by disparate vendors without anyone looking at the big picture. With converged networking, the entire network is designed for efficiency and scalability, enabling properties to add new services and functionality in a more cost effective way. Network performance can be configured and monitored from a single common infrastructure– onsite, or off –streamlining management and making it easier to identify and address issues before they become a larger problem. No longer in separate silos, maintaining and operating all of your property systems via a single connection minimizes the technical and physical resources you need. Done correctly, a converged network can eliminate redundancies in everything from power usage and maintenance costs to reducing overall environmental impact. When your guests can use WiFi anywhere on the property you are encouraging them to engage with your brand, increase revenue opportunities and simplify the overall guest experience. With more and more consumers utilizing mobile devices for making purchases, staying in touch with business, family and friends, and researching products and services, it is more important than ever that access to WiFi is ubiquitous during a stay. From opening their room to ordering room service to receiving personalized offers, a network that gives your guests what they require can set you apart from the competition. What level of convergence does a property need? How much is enough? There are different ways to combine services depending on your needs. A new property may design a network from the ground up to accommodate every system in one unified network form the back office to the poolside bar. Older properties may see savings and efficiencies simply by combining VoIP, IPTV and HSIA. Regardless, your cabling infrastructure needs to be run in the right amounts, and in the right locations in order to support all of your technology services. Finding a partner that can handle this is critical to the success of your network. A lot of collaboration, insight and planning go into establishing infrastructure. Whatever the case, don’t be shortsighted –it pays to look at costs and anticipate complexities 5-10 years from now. Define your level of convergence – including the security, technology and services you need. Certain elements will need to stay behind your firewall, like Guest Services, Mobile POS and Guest WiFi as well as PCI Security Standards for all credit card transactions. Outside the firewall is where your VoIP, Entertainment, Surveillance and IPTV systems can live. Air gap and security like room door locks, hotel bookings and PMS systems are another level of integration. Define your technology and network requirements and how they will work together, ensuring your network can support your services. From switching and firewalls to gateways and redundancy, each piece of the puzzle is critical to the success of the installation. For example, WiFi considerations like hallway vs. room installations can mean a huge difference in signal strength and coverage. 5G is becoming more the norm and it simply won’t penetrate through walls, particularly in urban, congested areas. Build in core redundancies where you need them. Often you will need to select choice components to back up and implement full redundancy when it fits your requirements and your budget. With all services on these networks it needs to be reliable. You and your vendor need to know all the ramifications of what happens if your network fails and build in the redundancies to ensure it doesn’t. When is the right time to install? As with all technology, being shortsighted never pays. Future proof the building – look ahead in 10 years. Review what core components can be used moving forward? The 10 GbE standard is fully interoperable with existing Ethernet protocols and will be a standard moving forward. With the proliferation of data and devices, we will simply need to push this much data. When looking at how much to invest in future proofing your technology, take into consideration the costs of multiple networks vs. implementing and managing one, with almost unlimited potential for adding services in the next 10-15 years. Evaluate savings of converged network and redundancy – and how you apply them to make the network as robust as possible. Make it mission critical. How can a Project Manager help with Converged Networking? Think of this as the glue that holds it all together. Your Project Manager (PM) will be the company that controls the infrastructure the rest of the vendors use. With full convergence, a PM will manage the entire network including: coordinating vendors, providing requested network resources for ISP, WiFi, cabling, PMS and custom integration, as well as 3rd party integration, managing network requirements, and providing a single point of contact for all communications. With structured cabling, a project manager can help with the initial build-out and onboard each vendor laying a new service on one at a time, working at each stage to analyze traffic and optimize network resources. Project managers can help prevent vendor conflicts and cost overruns, ensure compatibility and integration of all systems and applications and ensure quality of service from firewalls to AP’s and Ethernet ports. Look for a company with a proven track record in the hospitality field – who not only understands compliance with industry and brand standards, but someone who also has experience with legacy systems and infrastructure and can advise on the best way to integrate both for time and cost savings. How does 802.11ac Wave 2 fit? What ties all this technology together and enables guests, staff, and hotel management to get full use of all their devices is access to great WiFi. In order for all of this to work, properties need excellent enterprise grade Internet that can support the proliferation of devices that your guests need to get online – from laptops and tablets to wearables and smartphones. Hotels will have to have WiFi robust enough to accommodate all this expanding technology. Failure is not an option. So what technologies do properties need to understand and implement to accommodate all of these devices, applications and bandwidth? As the need grows, wireless networks are being developed not only for coverage, but for capacity. Hotels need faster application performance, increased data transfer capability and speed, and the ability to support multiple users and concurrent sessions. With new technology and streamlined implementations, hotels can reap the benefits of a more responsive, stable WiFi network. To start with, there is a new 802.11 WiFi standard that promises more bandwidth, greater speeds, and support for a new generation of compatible devices. Understanding how the new standard and its components and what it will mean for your infrastructure planning over the next 5-10 years is key to staying ahead of the competition. 802.11 is a set of standards, developed by the International Institute of Electrical and Electronics Engineers (IEEE), that govern wireless networking transmission methods. The new standard in WiFi is 802.11ac Wave 2. It is different from the first 802.11ac wireless specification in that it utilizes Multi-user Multiple Input Multiple Output (MU-MIMO) technology to help increase wireless speeds from 3.47 Gbps to 6.93 Gbps. Just like our devices have upgrades – smartphones, tablets, laptops – each iteration of these 802.11 standards makes improvements and advancements on the previous standard. 802.11ac was designed to help deliver increased bandwidth and improve wireless reliability to meet the growing demand. And it has finally arrived. The MU-MIMO technology simply means that wireless routers can now transmit to and receive data from multiple WiFi devices at the same time (as opposed to the single-user multiple-input and multiple-output (SU-MIMO) technology that supported one). In addition to making a network faster, MU-MIMO can aid in increasing its capacity, allowing it to handle more WiFi devices and faster video and voice streaming. (Networks with a dense number of users in an area, such as public WiFi hotspots, should do better as well with this technology). Newer WiFi networks also utilize both the 2.4GHz and 5.0 GHz spectrums. The 2.4 GHz spectrum has the greatest range and universal capacity, however it’s limitation and growing congestion makes it prone to interference from itself and non-WiFi devices (like when a guest wants to download your new app and their phone creeps to a halt). As the 2.4GHz spectrum becomes overcrowded and interference builds, the 5.0GHz is utilized to provide additional coverage for more devices. Most modern mobile devices look to connect via 5GHz first and 2.4 second. Hotels should be looking for a dual-band (2.4 & 5 GHz) solution, to double potential wireless bandwidth, support backwards compatibility with older 801.11 b/d/n devices and to help eliminate interference. Beamforming is a new technology that can also help improve bandwidth by concentrating signals that travel to the WiFi router, optimizing the signal for greatest accuracy, speed, fewer errors, and instant bandwidth delivery. Think of it as having the accuracy and focus of a laser beam. When utilized with MU-MIMO, smart antenna patterns can determine and utilize the optimal signal path and polarization, ensuring crystal clear data transmission for multiple devices. And let’s talk 10Gbit Ethernet. This is an easily deployed, cost-effective technology that can support high-speed within existing networks. Data is transmitted in both directions on a signal carrier at the same time. This means there is virtually no delay between initiating a task on a device and its completion. Now that’s fast. The 10 GbE standard is fully interoperable with existing Ethernet protocols and will be a standard to know moving forward. If properties are currently running a wireless network with 802.11n, most devices coming out will be backwards compatible – at least for the short term. Those running at 2.4GHz only will need to upgrade wireless to a more sophisticated infrastructure to prepare for the arrival of 802.11ac Wave 2 – and the new technologies that will come with it. The benefits of wireless are negated if uploads and downloads are painstakingly slow. A higher bandwidth results in significantly faster transfer speeds resulting in less frustration and greater guest satisfaction. With multi-use technologies, everyone can access their devices at once without a loss of speed. 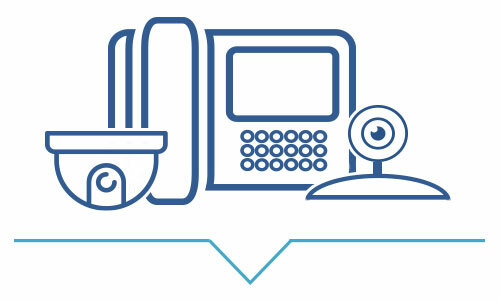 Delivering a converged network means an integrated experience from check-in to check-out and everywhere in between – ensuring your guests have connectivity for all of their devices and needs, helping you engage with your customers, generate revenue and set your brand apart from the competition. Whether you are starting new or re-engineering an outdated network, there is no better time to implement cost-effective networking that delivers now and lays the groundwork for what is to come. Find out how Deep Blue Communications can put our hospitality WiFi experience to work for you and deliver a converged network that sets your brand apart. Contact us for a consultation today!